Required input connectors: These connectors receive data, such as a terrain or a mask, from another node. All input connectors must be connected so that the operation associated with the node can be executed. 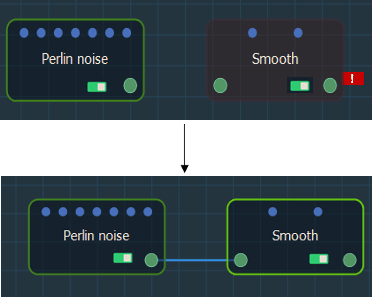 Optional input connectors: Optional connectors link to a Calculation node or a mask node and replace the input value in the linked node's parameter. 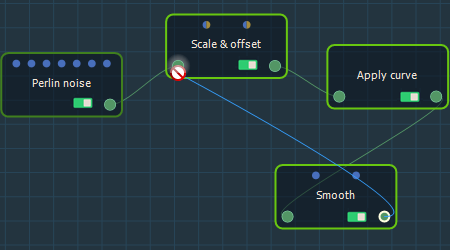 Blue connectors link to Calculation nodes (Formula, Constant, etc.) 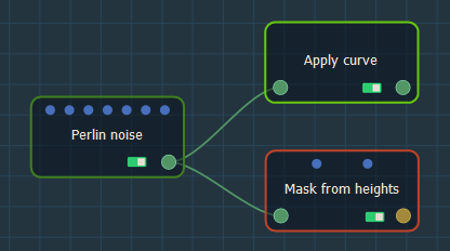 and bi-color connectors link to either a Calculation node or a mask. When you click on a connector, the 3D view displays the data associated with this connector, whether it is a terrain, a mask, a color map, or a vector map. For example, when you click on the Rock erosion node optional connector linked to the painted mask, the painted mask appears in the 3D view. When using masks, you can drive one parameter of the output terrain to give a variable result over the terrain. 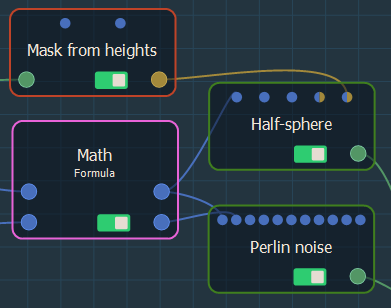 Output connectors: These connectors correspond to new data, such as a terrain or a mask, calculated by the node. Links connect node connectors. An input connector must link to an output connector and the connectors must be of the same type, for example terrain connectors; it is not possible to connect a terrain connector to a mask connector. To connect nodes with a link, click on a connector on the first terrain and drag the mouse cursor to the connector on the second terrain, and release the mouse button. You can create several links from one output connector. If the mouse cursor changes into a "no-entry" sign, it means that the two connectors cannot be connected together. This is the case if the two connectors are two input connectors or two output connectors, or if they do not have the same type (e.g. terrain and mask). 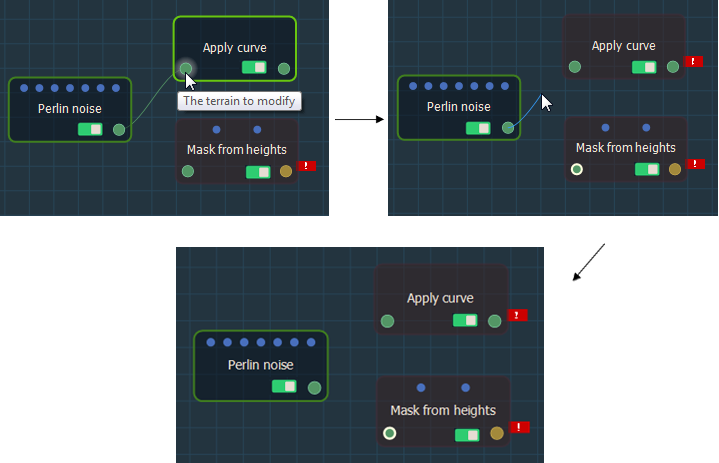 For example, the Perlin noise node generates an output terrain, but the Reduce mask node expects an input mask, so they cannot be connected. It is also forbidden to create a new link that would create a cycle inside the graph. To change a link, i.e. point it to another connector, click and hold the mouse button the connector to detach it, drag the mouse cursor to another new connector, and then release the mouse button. Click on one of the two connectors connected by the link, keep the mouse button pressed, move the mouse cursor to a place where there is no node, and then release the mouse button. Right-click on a link and select Delete this link. Select a link, press the Delete key.